There’s a new kitchen appliance that’s getting a lot of buzz lately. 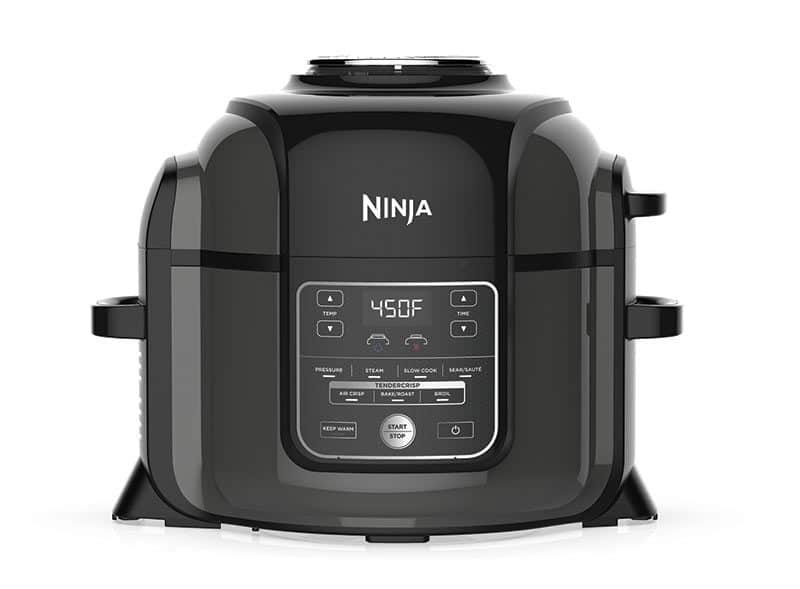 The new Ninja Foodi is a combination pressure cooker and air fryer. Check out my Ninja Foodi Pressure Cooker Review. Ninja sent me a Foodi to review. Ninja’s innovative idea is to give you TenderCrisp foods from one appliance. Tender from pressure cooking and then crisp using the air fryer / crisping lid. 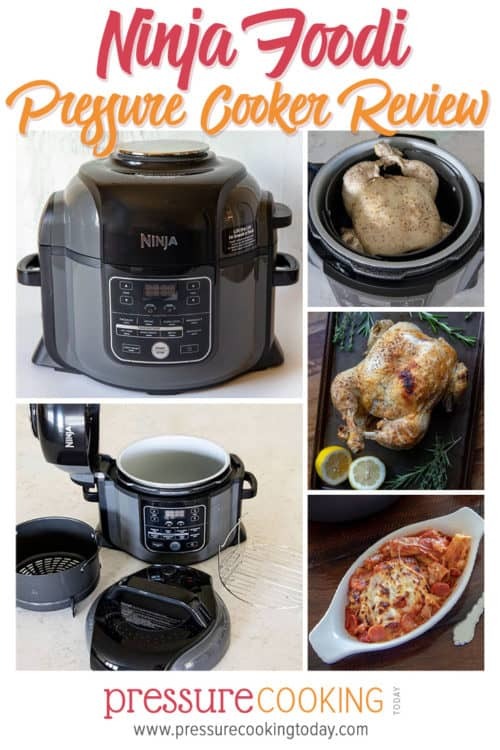 The Ninja Foodi can also be used as an oven, steamer, roaster, dehydrator, and slow cooker. 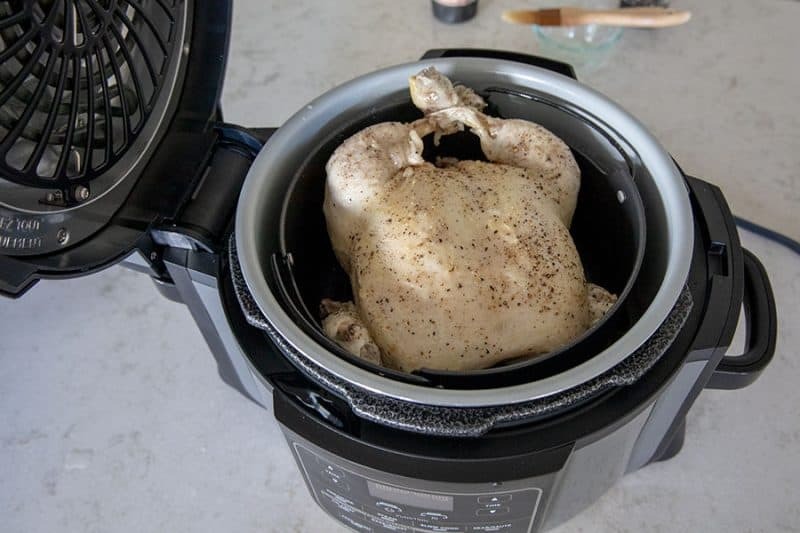 I’ve never used an air fryer before, so I also sent a Foodi to my good friend and one of the moderators of my Pressure Cooker Facebook Group, Genene, to test. 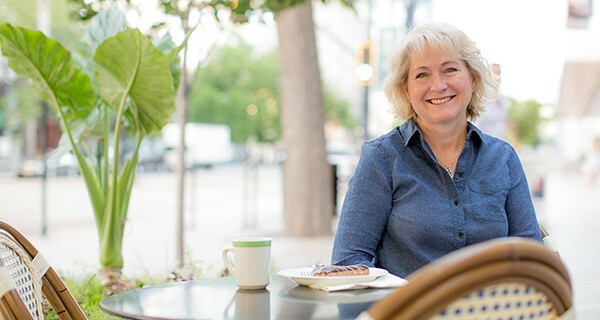 Genene loves cooking with her electric pressure cookers and she has a couple of air fryers that she uses on a regular basis in conjunction with her pressure cookers, so I knew she’d be able to tell me how the Foodi stacks up. The Foodi was easy to operate. 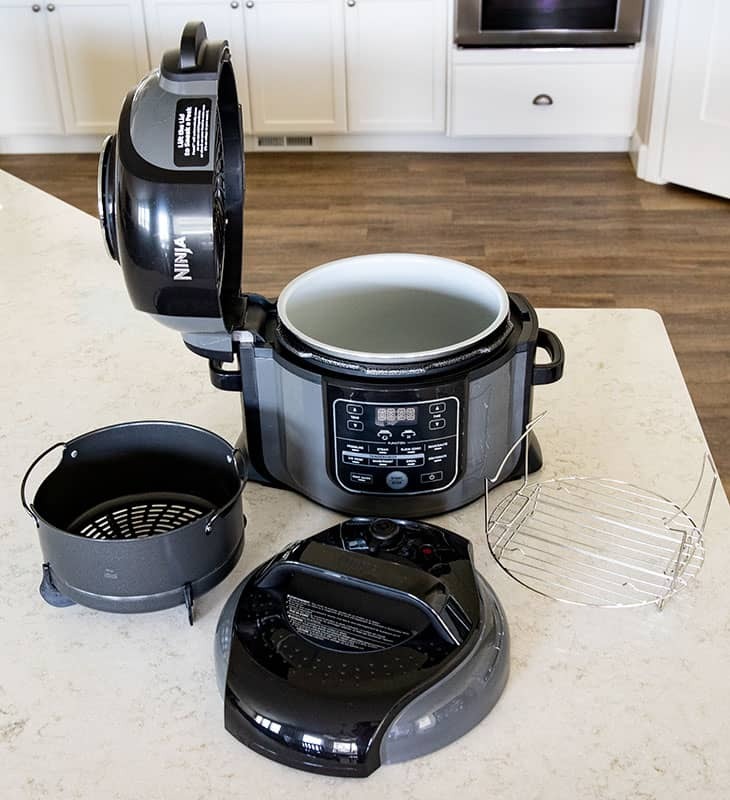 It operates similarly to the Instant Pot and other electric pressure cookers, so all the recipes in my cookbook, on my site and other pressure cooking websites can be made in the Foodi. The Foodi has a very nice display window that tells you what’s going on in the pot, how much time is left, hints to shut the lid, and so much more. It has blue lights that rotate in a square on the display while it is pressurizing and they stop rotating when it has reached pressure. The instruction manual included with the Foodi was helpful and easy to follow. A Cook & Crisp basket and a reversible rack (hi and low positions) are included. The ceramic non stick coating on the pot seems well made, and some prefer it to a stainless steel pot. 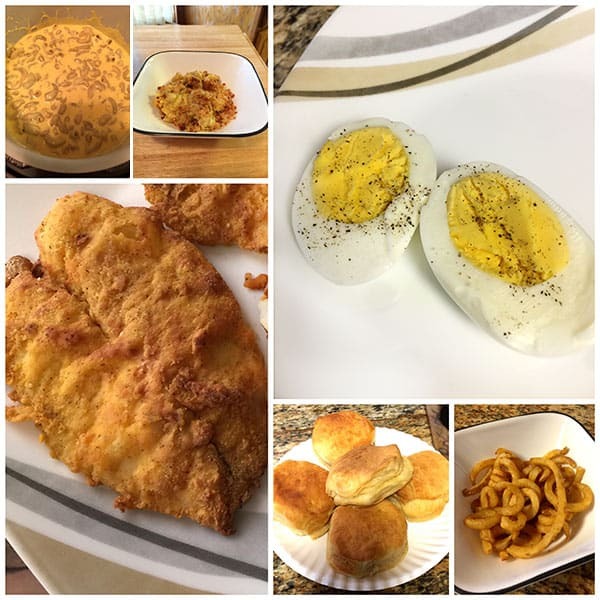 The air fryer does a great job of crisping up foods. The air fryer time counts down and shuts off after the time is up. So you don’t have to stay in the room to shut it off. 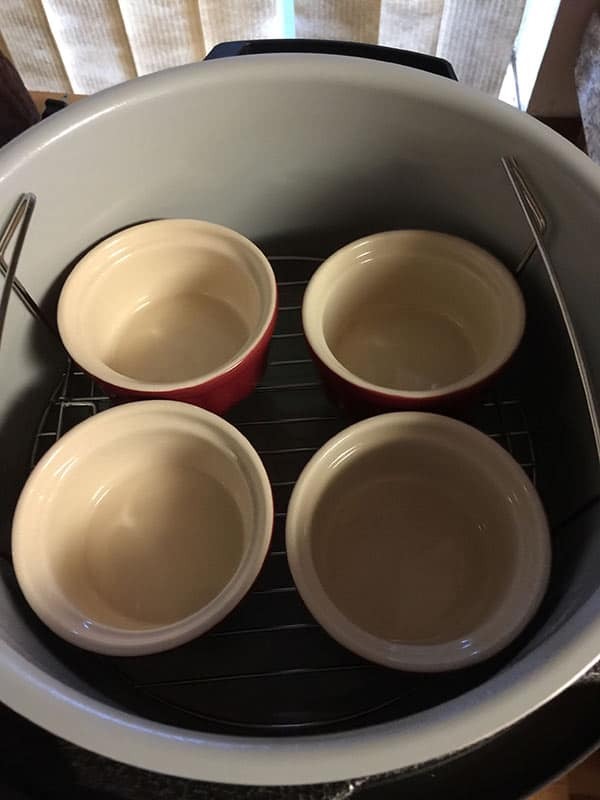 The pot is a bit shorter and wider than the Instant Pot (I assume so you get more surface area for better browning), so you can easily fit 4 custard cups in the pot without having to stack them on top of each other. Great for desserts (such as creme brulee) or individual portions (such as egg muffins). You’ll need to have a big space, it’s big and heavy. The crisping lid (air fryer lid) is hinged and not removable. You need room for the crisping lid to be open while using the pressure cooking lid. You can’t cook with the Foodi on a counter under your cabinets. The pressure release valve on the Foodi is short and a little more difficult to maneuver without getting burnt by the steam than the Instant Pot valve. Hot air comes out from the back of the unit as it’s air frying, so you’ll need to place it away from walls and cabinets. Many accessories that fit in most 6 quart pressure cookers will be too tall to use in the Foodi. The beep at the end when your time is up is not very loud and not adjustable. It’s nice having only one appliance that can do two things, but there are drawbacks as well. 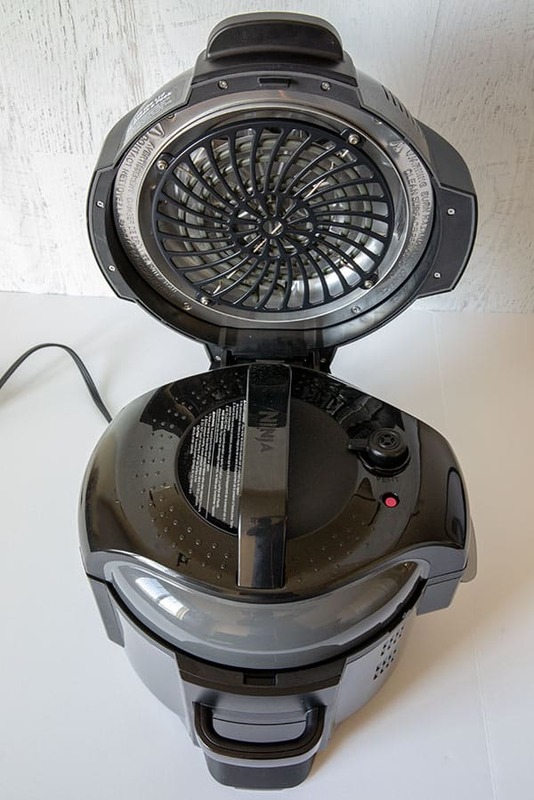 The air frying lid / crisping lid is not removable. As shown in the photograph above, the crisping lid stays in the open position while you’re pressure cooking. The pressure cooking lid is a separate, detachable lid, so you’ll need room in your pantry / kitchen to store it. Genene felt the crisping lid was in the way when she was using the saute feature to saute vegetables before pressure cooking. The first thing I cooked in my Foodi was a roast chicken. I used the recipe that was in the recipe book that is included with the Foodi. The recipe called for a 4 to 5 pound chicken. The smallest chicken my store had was 5.5 lbs. It was a little bit too tall for the Foodi, but it fit in the crisping basket fine. The chicken was a little too close to the top and there were lines on the chicken leg where it touched the crisping lid. The recipe called for cooking it in the Cook and Crisp Basket. It’s great that the basket is included with the Foodi. The holes in the bottom of the basket make it great for pressure steaming food, as well as crisping up food using the crisping lid. My only complaint about the basket is that the legs have lots of crevices that are difficult to clean. 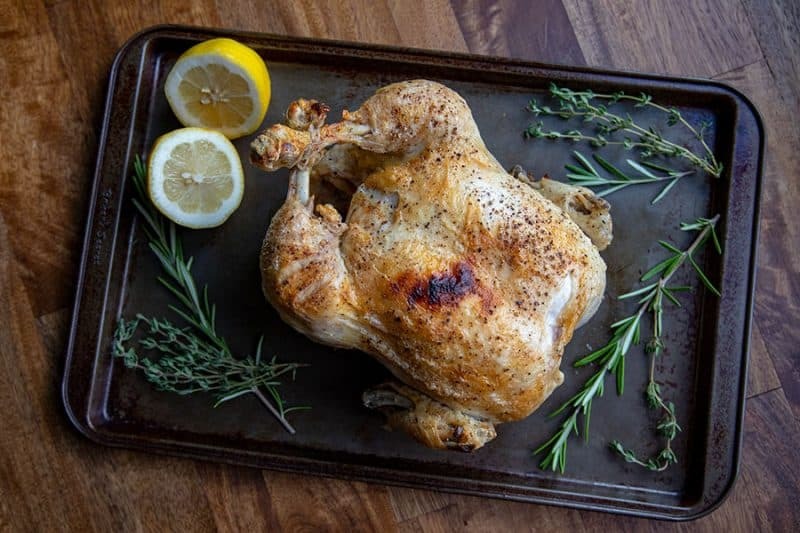 The Herb-Roasted Chicken recipe has you add lemon juice, hot water, honey, peppercorns, kosher salt, fresh thyme, and garlic to the pressure cooking pot. I found the flavorful ingredients in the bottom of the pot didn’t really infuse the chicken with flavor. I added some fresh rosemary to the recipe and my husband said he could taste the rosemary a little, but I couldn’t really taste the lemon, thyme or honey. If I made the recipe again, I would probably make a compound butter and put it under the skin rather than rely on the pressure cooking liquid to flavor the chicken. However, I was surprised just how crisp the skin on the chicken was after the 15 minutes of air crisp time. The manual says to removing the pressure cooking liquid from the bottom of the pot for best results, but the skin was crackly crisp even without removing the pressure cooking liquid. My chicken wasn’t as tender as I’d like, so I probably should have increased the pressure cook time more than 2 extra minutes. The first recipe Genene made was the Baked Macaroni & Cheese recipe from the Foodi cookbook. Genene said it seemed like a lot of liquid prior to the Air Crisp time of 7 minutes. But it’s the perfect about of liquid after air frying; the noodles absorb the liquid as the topping browns. 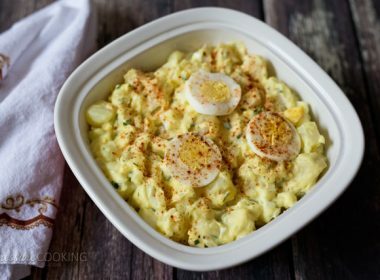 An interesting twist on this mac and cheese recipe is you start it with lemon juice and baking soda, cook it for 0 minutes and let the noodles finish cooking during a 10 minute natural release. The noodles were softer than Genene likes, so the next time she would reduce the natural release time to 8 minutes. Both she and her husband enjoyed the mac and cheese recipe. Genene also baked biscuits, Louisiana Battered Flounder, and Frozen Curly Fries using the crisping lid; all crisped up beautifully. She tested the pressure cooker by making hard boiled eggs, and the timing for hard boiled eggs was exactly the same as in her Instant Pot. There was a Pepperoni Pizza Pasta in the Foodi recipe book. Since I also have a Pepperoni Pizza Pasta recipe in my cookbook, The Electric Pressure Cooker Cookbook, I thought it would be fun to give their version a try. After pressure cooking the noodles and sauce for 6 minutes, you top it with cheese and pepperoni. Then you use the air fryer lid to melt and brown the cheese. The cheese browned a little more than I usually like. However, I liked that you can lift up the air fryer lid any time while it’s cooking. The blower pauses while the lid is raised and you can check and see if you want more or less browning. 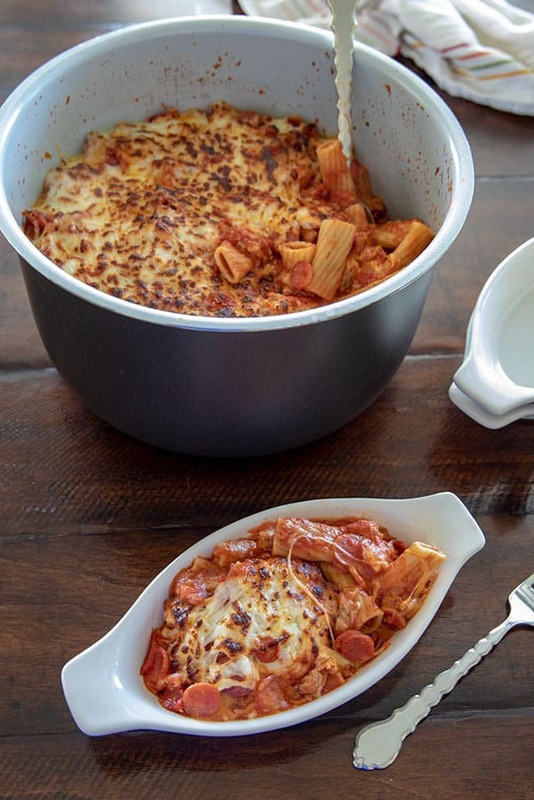 While it was great to be able to melt and brown the cheese in the same pot, the disadvantage is that you don’t have as much surface area as you would in a 9×13 pan to spread the cheese out over the pasta. Also, it makes a big pot of pasta. I had a leftovers that I store in the pressure cooking pot in the fridge, so the inner pot wasn’t available to cook something the next day without transferring it to another dish. Get my version of the Ninja Foodi Pressure Cooker Pepperoni Pizza Pasta recipe. Overall, the Ninja Foodi is a great all-in-one product. 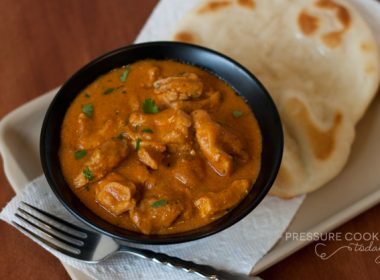 It does an excellent job of pressure cooking and an excellent job of air frying. Genene and I were both impressed. If you have a small kitchen, the Foodi is probably not right for you. 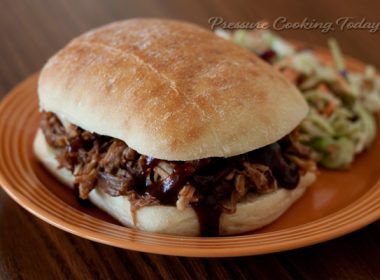 But if you have the space and have been considering buying a pressure cooker and an air fryer, you’ll be pleased with the quality of the Foodi. The Ninja Foodi is available on Amazon, as well as in stores. Or, you can buy it directly from Ninja. Disclosure: I was sent a Ninja Foodi to review, but all opinions expressed are always my own. Members of my Facebook Group, have bought the Ninja Foodi and are loving it. There’s also a Ninja Foodi Facebook Group. 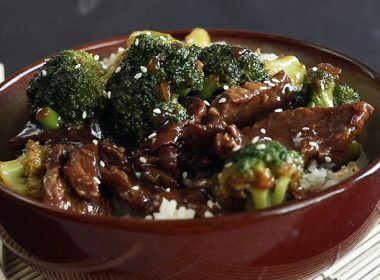 All of my pressure cooking recipes will work well in the Foodi. 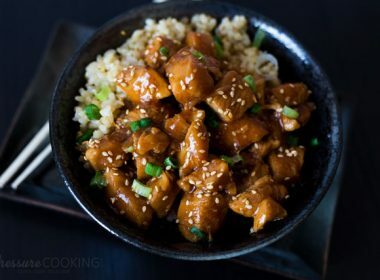 Start with these Easy Pressure Cooker Recipes. 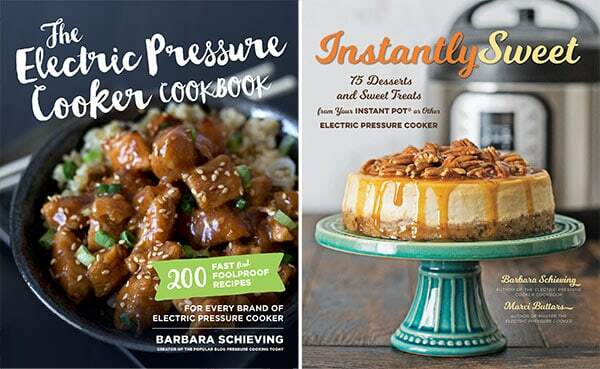 My Getting Started post has great information about using a pressure cooker. You’ll also want some cookbooks and accessories to have even more fun with your new Foodi. My foodie stopped reading the lid, when I press the pressure cook and put the pressure lid l, it keep saying lid on the screen.